Be Quiet! updates its power supply lineup with new Pure Power L8 units as well as a refresh of the L7 lineup. 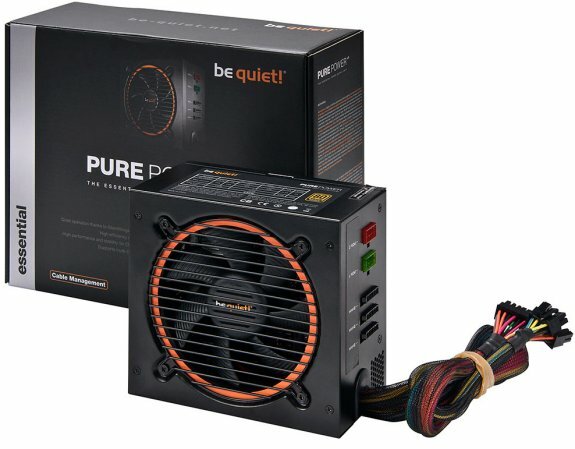 Be quiet!, market leader for PC power supplies in Germany since 2008 according to GfK market data, announced today the release of its all new Pure Power line. The new L8 generation of power supplies brings many features from their prior premium models, including Silent Wings fan technology and cable management, to this new line targeted to achieve fresh levels of silence and performance at popular prices. At the same time they have released new 630 Watt and 730 Watt versions of their L7 series. The new Pure Power L8 series consists of four models, ranging from 430 to 730 Watts of power. All four of them are certified with "80Plus Bronze" and guarantee a very high and continuous efficiency of up to 88%. Additional new features include cable management, SilentWings fans and enhanced connectivity. All new models now make use of the renowned be quiet! SilentWings fans in 120mm size. These fans earned an excellent reputation among silent computing enthusiasts. So now, even the value-priced level PSUs from the German company will be nearly inaudible, comparable to the more advanced Dark Power Pro and Straight Power models, whose low noise level has been independently confirmed multiple times by international press. be quiet! also decided to integrate their low noise fan grill design into the new L8 series. With a view toward flexible connectivity, Pure Power L8 models have up to four PCI-Express connectors. All models are complete with a variety of cable and connectors to give users full command of their system while minimizing cabling for better airflow. And they provide maximum built-in safety protection to safeguard valuable components and data; over current (OCP), over voltage (OVP), under voltage (UVP), short circuit (SVP), over power (OPP) and over temperature (OTP) protection. "Second to none in the industry..."
be quiet!’s product development team was given a clear design objective for this series: Use only components which contribute to reliability, stability and silence at a good price point, since Pure Power is supposed to be a combination of the highest possible performance with the smallest possible price. These power supplies are shipping now. Estimated retail prices (including VAT) start at 69,90€ for 430 Watts of power. Models with 530 and 630 Watts will be 89,90€ and 99,90€ respectively. The top model with 730 Watts will sell for 109,90€. Not only does be quiet! introduce the new L8 series today, but they also listened to their customers and refreshed their recent L7 series. There will be two new versions with 630 and 730 Watts. This completes the L7 roundup, meaning that there are now six models from 300 to 730 Watts. The 630 Watt version will have an estimated retail of 74,90€ and the top model with 730 Watts will be 89,90€. Both are already available.